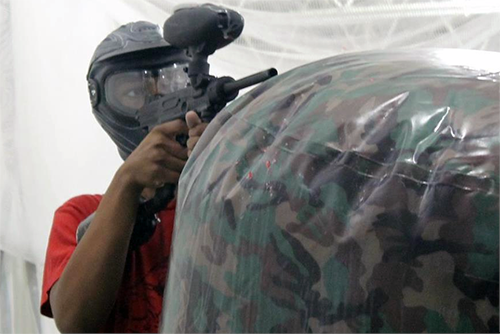 Elimination is perhaps one of the simplest paintball games to play and learn. Players are divided into two teams and start at opposite ends of the field. As the name implies, teams are tasked with eliminating all of their opponents. This is done by marking opponents with a paintball or forcing your opponent to surrender. A time limit may be imposed on the game to prevent a stalemate. Capture the flag comes in two variations–two-flag and center flag. In the center flag variation of the paintball game two teams compete over a flag located in the center of the paintball field. Teams are tasked with the goal of capturing the flag and hanging it in their opponent’s flag station. In the two-flag variation of Capture the Flag, a flag is hung at each start station. Teams must fight their way to their opponent’s flag station and capture their opponents flag. Once the flag is captured the team must return it to their own start station. For attack and defend, players are divided into two teams. The distribution of the players may not be equal. Player distribution is typically determined by the difficulty of overtaking the defending team’s position. The attackers may outnumber the defenders by a 3:1 or 4:1 ratio. The defending team will start in an area that’s easy to defend, usually a castle or bunker located in one corner of the field. The attacking team will start at the opposite end and will attempt to overtake the defenders’ position. A time limit is typically set for this game of paintball. The game is one when either team is eliminated or the attacking team overtakes the objective. The defenders can also win the game by playing until time runs out. King of the hill is not unlike the game you played as a kid. Two players compete one-on-one, vying to eliminate their opponent. The winner stays on the field and is challenged by the next player. A winner is declared once everyone has had a turn to be king of the hill. In bomb squad, one team (the bad guys) is given bombs to hide throughout the field. The number of bombs will vary based on the size of the group and the size of the playing field. Once all the bombs are placed, the other (the bomb squad) team enters the field and the match begins. The objective is for the bomb squad to find all the bombs and return them to their start station. The bad guys attempt to defend at least one bomb until time runs out.